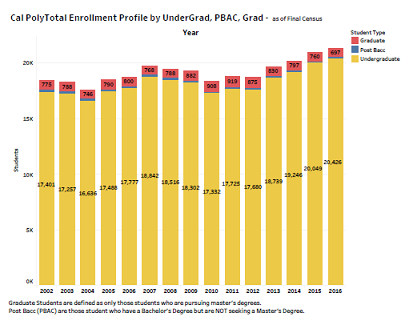 Like other universities, Cal Poly follows the progress of its students— both freshmen and transfer — by annual cohorts entering in a particular academic year. The university considers their entering academic qualifications — high-school GPA, test scores, etc. — in relation to the time required for them to graduate after completing their degree programs. This time-to-degree metric can conceal much about a group of students, but it is nevertheless a standard measure of institutional success in higher education. was the average high school GPA for freshmen entering in Fall of 2016. 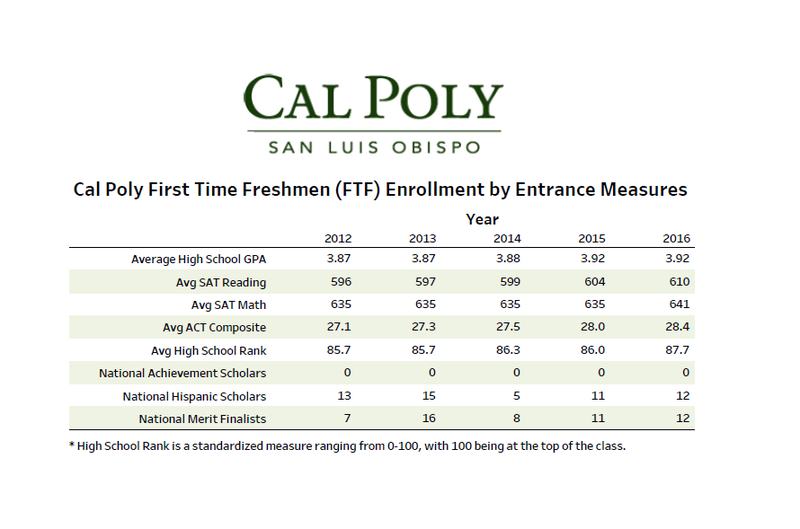 See First Time Freshmen Enrollment by Entrance Measures for more information. was the average unit load for all students in Fall 2016. 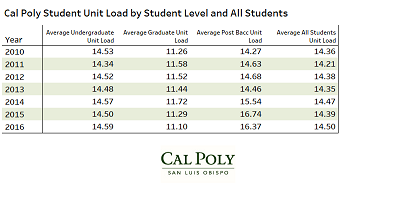 The average unit load for undergraduates was 14.59. See Unit Load by Student Level and All Students for more information. was the number of undergraduates in Fall 2016. The Total number of enrolled students was 21,306. See Total Enrollment Profile for more information. was the percentage of women among all students enrolled at Cal Poly in Fall 2016. This was equivalent to 10,059 women out of a total of 21,306 students. The percentage of under-represented minority students was 19.5%. The percentage of Pell Grant recipients was 16.4%. 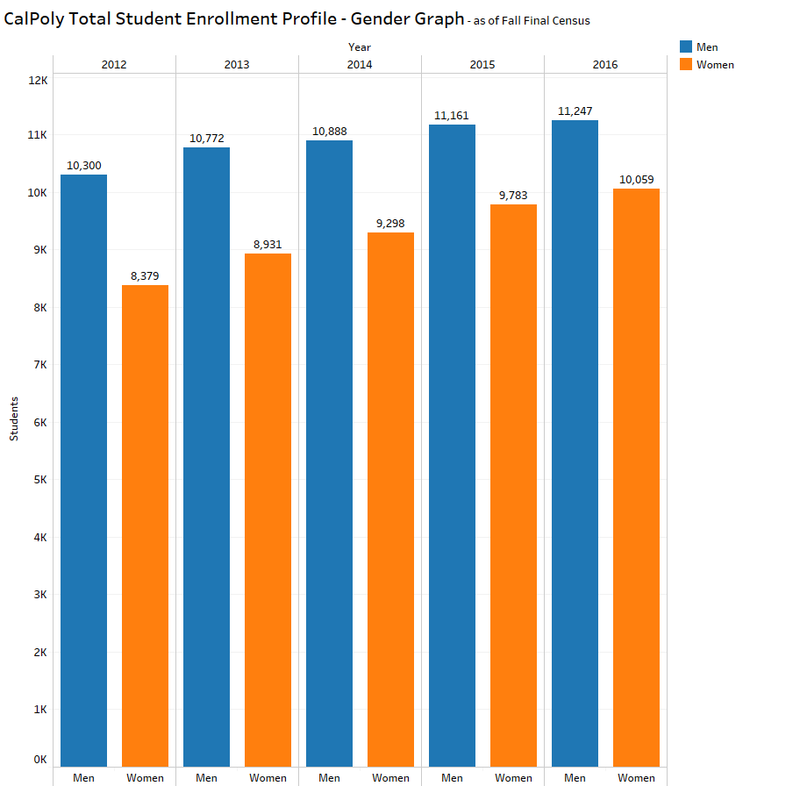 See Total Enrollment by Gender for more information.